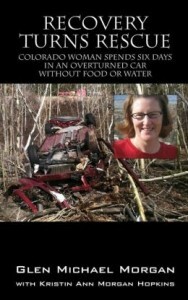 Our daughter, Kristin survived six days in an overturned car without food or water. Although she had to have both feet amputated, she is alive today because of a Good Samaritan. It is a miraculous story of survival that has led to appearances on CNN Anderson Cooper, Inside Edition, USA Today, and in international magazines Woman and Chat. Kristin Hopkins, a dedicated single mother of four children, was working and getting her life in order with her family’s support. One day, she left for work…and never came home. The victim of a terrible accident, Kristin spent six days in her overturned car without food or water, and when a passerby happened to see her car, nobody thought she was alive. But when the first-responders arrived at the car to retrieve her body, they found to their amazement that she was still breathing, though her body temperature was dangerously low, and she had almost no blood pressure. This is the agonizing, inspiring true story of Kristin’s road to recovery through incredible courage and persistence. Follow Kristin and her family from the first terrifying realization that she was missing, through the ordeals of the ICU and the shock of finding out that her feet would need to be amputated to save her life…and then share with them the miracle of Kristin’s recovery and learning to walk again. This heartfelt story of everyday heroes will restore your faith in humanity and inspire you with a demonstration of what the human spirit can overcome. Both my wife Connie and I would appreciate your sharing this message with your LinkedIn contacts and your Facebook friends.